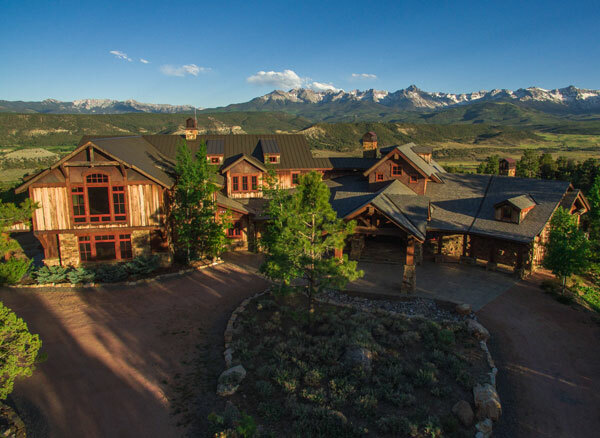 Real estate buyers seeking true value in a luxury mountain retreat will find an incredible buying opportunity with the luxury custom home at 1037 Catamount Drive in Ridgway, Colorado. Built with the finest materials and craftsmanship, the R&R Retreat rivals any custom home in Aspen, Telluride, Santa Fe or Park City. With 13,067± square feet of living area and almost 15,000± feet under its roof, the home is a stunning example of world-class mountain architecture. Accompanying the home is a 5,600± square foot “toy barn” with a 2-bedroom guest apartment. The total construction cost for the home, workshop and guest home was over $12 million. Ridgway, Colorado is a quiet western town with charismatic energy that is only 45 minutes from Telluride and just minutes from the famous town of Ouray, known as “Switzerland of America” with its hot springs and incredible towering peaks. Known for its stunning vistas of two different mountain ranges, Ridgway has some of the most incredible scenery in the most scenic state in the US. The Cimarron Range lights up the skyline to the east of Ridgway, while the Sneffels Range, only 6 miles to the south, is on postcards and calendars all over the world. The original “True Grit” movie was filmed near Ridgway, and the “Hateful Eight” Tarantino movie was filmed about 20 miles away. No expense was spared in the construction of this Colorado mountain home. Construction began in 2004 and was completed in 2007. Every aspect of this home was specifically designed and executed as a custom detail, from the floor plan and foundation to the chimney stacks and roofing tiles. Since its completion, the home has been meticulously maintained and no one has lived in it. Main Home Has Never Been Lived In! The R&R Retreat has been meticulously maintained as the main home has never been lived in! All guests have stayed in the guest home, so the home is move-in ready for a new owner! The R&R Retreat is beautifully crafted with the finest materials. The foundation was carefully engineered; the home was sited to capture the most beautiful views of two mountain ranges. Materials were chosen for durability, beauty, and strength. Energy efficiency was a major factor in its design, with R38 walls, R50 ceilings, and high-efficiency windows. Self-sufficiency and redundancy was a key element in the planning of the property. The property has been meticulously maintained. Over 10 years after its completion, the home looks like it was finished yesterday, with no cracking, warping, or any visible flaws, and it has a detailed inspection report to verify that it is in incredible condition.